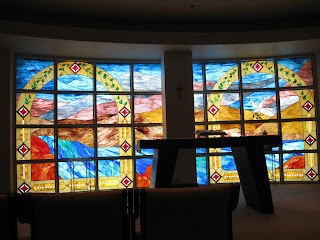 This photo is from the hospital's chapel window. Similar to our St. Joesph's Hospital, St. Rose's Hospital is Catholic faith based hospital. Dr Rutledge's staff is amazing and their choice of healthcare provider fits perfectly. The hospital's staff/nurses were great especially since this was my first time to have surgery. God put so many opportunities in my way to make this happen. The Doctors and staff were all able to make my experience a positive one and you could tell they were a faith based family. I believe nothing happens on accident and He has surely blessed me.